L'Etoile Bicycles (Charles Verneau, Circa 1915) Advertising Poster (39.5" X 55"). An unusual advertising depiction of military use for bicycles. A French dispatch rider sets out on a L'Etoile bike, one of the myriad nameplates that have disappeared over the years. Though the award medals date from the 1890s, the military action seems to be from the WWI. 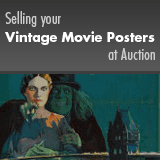 Poster has been on vintage canvas and would benefit from relining. Good/Very Good condition on Canvas.